Since WinSavvy is a blog that strives to provide highly actionable and quality packed content to help bloggers and entrepreneurs win at their game and get rich, I believe in WinSavvy's existence as a community site. In short, I value both your feedback and your knowledge. I would also love to hear from you and know how I can help you better. 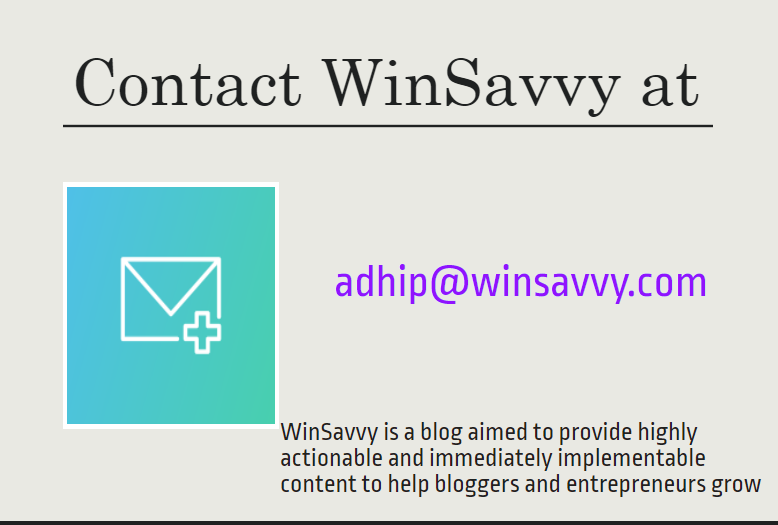 Feel free to contact me for any reason whatsoever at adhip@winsavvy.com and we will get back to you as soon as possible. Have you got any query? Or is there anything you don't agree with at out site? Do you want to add more (or some missing )details to our posts? Do you want to share your personal experience after using these techniques? If you fall in these categories, I request you to comment or email us and share your story with us too! However, if you want to contribute to WinSavvy, send us your topic idea at contribute@winsavvy.com and I will send you confirmation if I like it. Please go through the guest posting guidelines before sending us your pitch, or else there's a high chance that it may get rejected.